With the help of experts at The National Archives, we've put together a guide will help you better understand the unique elements of the 1939 Register. If you're new to Findmypast or to the Register, our how-to guide to exploring the Register is a good place to start. We've also created a series of videos that give information about the history of the Register, its importance and the work carried out bringing it online. They're all here in the below video, but if you don't have time to watch, just visit our YouTube 1939 playlist on Youtube where you'll find the video broken into short chunks. One question that has come up frequently is how the transcription process worked. Owing to privacy reasons, rather than dealing with horizontal rows of text each transcriber worked in vertical columns so that they could never see the entire record of an individual whose record would be closed when the Register was published online. The names on the Register were transcribed in transcription houses in Britain, and we were contractually obliged to meet an accuracy rate in readable records of 98% or greater. As the Register consists of the personal handwriting of 65,000 enumerators, errors will of course pop up, and there is a process to report any you may find. To report a transcript error, click 'Report an error' at the bottom right of the transcription page and then click 'Report an error'. Fill in the form on the following screen and if you have highlighted a legitimate error, we'll correct it as soon as possible. If there is an individual whose record should be open but isn't, because the person has died or is over 100, you can submit evidence of death (a death certificate) and if the record can be opened, we will let you know when it has been done. 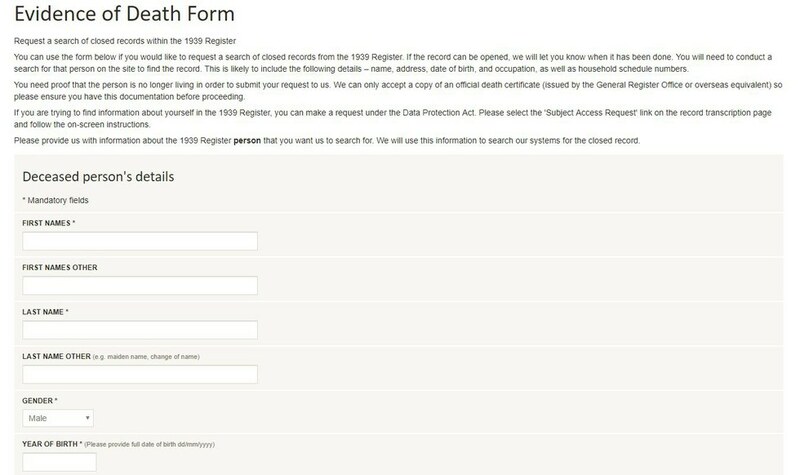 To request that a record be opened, go to the their household on the Register, and click the 'Open a closed record' button, then complete and submit the Evidence of Death form. You will find that some people who died prior to 1991 have closed records. This is down to the fact that not every death was added to the Register by the NHS. Unfortunately this is out of our control, however if you submit evidence of death we will open the record for you. We're working on cross referencing our death records with the Register in order to open more records. In addition, we run weekly updates that open the records of everyone who passes the 100 year threshold. If a record is closed, no element of it can be found in search. This is for privacy reasons and isn't something we dictate. This means that if every member of a household is closed, the entire house won't be searchable in the Register. The right hand page of the Register which we haven't digitised or indexed contains sensitive medical information that we're forbidden from publishing online. If the medical information of an individual stretched over two lines on the right, that person was duplicated on the left. If you see your relative on two lines with identical information, this is why. If a note exists on an individual's record that refers to another page, click the arrow on the right to be taken to that page in the image. 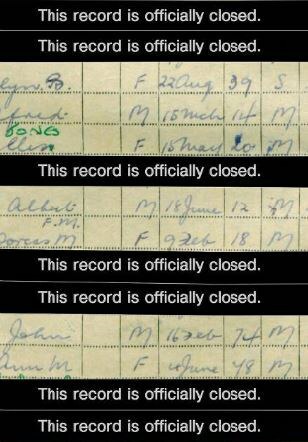 We hope this may answer a few of your 1939 Register search queries. Let us know if you have other search-related queries below, and we'll do our best to answer them. If you have general comments or queries on the Register, please email them directly to us at support@findmypast.co.uk, and our team will be happy to discuss.